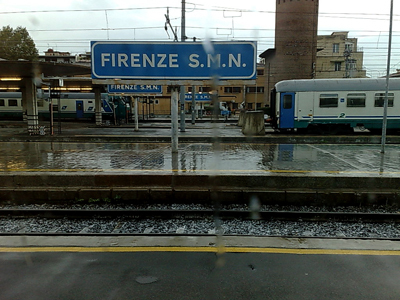 We arrived into Florence with rain and it seems we will leave with rain. We're catching the Eurostar to Milan where we hope to make the connecting regional train to Varenna-Esino. There's a short turnaround time so no delays are needed if we are to make it. In case you are wondering Varenna is a town on Lake Como. The train departs pretty much on time though the signs are not looking good when we stop at Bologna a little later than expected. As we arrive at Milano Centrale things are looking good again until the train inexplicably stops in the railyards for 10 minutes. Unbelievably close yet not close enough, the regional leaves on time and we watch it pull away from the platforms. Now with two hours to kill until the next train we drop off most of our bags into Left luggage - as the bags go through an x-ray machine, we keep the one with my film in it. As we avoid the umbrella sellers during our trek through the rain we head for a nearby cafe for a leisurely lunch - no photos as it wasn't anything great. By the time we return to the station, our train is surprisingly already on the platform a good half hour before it's ready to leave so we check out our bags and board. It's a good thing we did as by the time it's ready to leave, the train is absolutely packed. It's standing room only even in first class, with people packed into the carriage entrances. If the train we missed was the same, then we probably wouldn't have taken it. I have no idea why it is so full, could be because it is a Friday, the trains do tend to be more crowded. An hour later we arrive at Varenna to a light drizzle and since there are no taxis we walk to the hotel.